I wouldn’t say I’m an expert on cleaning or even detailing jet skis. But I would say I have clean hundreds of watercraft and boats to know some tips and tricks. I’ve been working at a Jet Ski Dealership since I was 15 and one of my very first jobs was cleaning a boat. The instructions were clear, here is a can of spray and a rag – Make It Look Good. Over the years I would say I have gotten a lot better at cleaning watercraft and jet boats in particular that I would like to share with you guys. I’ll be honest, my go-to cleaner is Simple Green. I buy a Gallon of it at a time and I have a spray bottle that I fill up with half water and half Simple Green. You got to keep in mind that with all soaps and cleaners they’re useless without water. So do half water and half simple green. You’ll want to use a garden hose and really rinse down the whole entire jet ski. The dirtiest part of the watercraft will be the footwells, so make sure you really get all the slime and goo out with a hose if you can. I never really been a fan of a pressure washer. It’s not that they’re bad, just really cumbersome. I do love and use an Electric Pressure washer since it’s easier to get going and doesn’t need maintenance or gas. I do highly recommend an electric pressure washer to make life a little easier. Be careful around decals and soft spots, I have damage mats because I got too close with the pressure washer so make sure to be careful. They make special boat soaps like these that work well. But regular car soap will work just fine for what we will do. I’m sure there is some guy getting really mad at me because I’m telling people to use car soaps when boat soap is specially formulated blah blah. Soap is soap. The only thing soap does is makes water more “watery” (yeah it’s really true). Plus the watercraft won’t become clean until you dry it. I’ll go into more detail as to why drying is the most important part later in the post. You can buy some really fancy foam sponges but don’t. Those foam sponges are horrible for cleaning a watercraft. The best thing to clean to clean a jet ski is just plain white rags like these ones with some fluff to them. I like using rags because I can use my whole hand with the rag and my fingers to get into places a foam sponge would miss. For really small areas I will use a flat head screwdriver with the rag over the tip. Just a regular 5-gallon bucket will work. Nothing special here. After you have done the first spray down I like to go back and spray it again with the seats off and all lids and storage places open. Besides you belongings, everything should be able to handle water getting on it. I would avoid spraying directly on any electrical parts and intakes of the craft. Make sure the drain plugs are out when you clean and also make sure you put the plugs back in when you’re done the cleaning. After everything is all wet I grab my 50/50 simple green and I spray everything down. I put extra coats on the footwells since this is where the sludge builds up at the most. I coat the engine and pretty much everything. With the simple green, you want to avoid aluminum and oxidized white fiberglass. You can put it on shiny white but the dull or oxidized white fiberglass can turn yellow. If you do get it on the oxidized fiberglass then allow it to sit in the sun and it will slowly bleach it back. I’ll then rinse off the simple green. This is removing the first layer of dirt. Once the simple green is off and gets the ski nice and wet again. This time, I take my bucket of water with car soap (you don’t need much car soap, just a few drops) and I just get my rag wet. I spray the area where I’m going to clean with some more simple green and then I quickly wipe it off with my rag that has soap and water on it. Break the craft up in 4 areas and clean in the shade. Make sure you clean off all soaps before moving on. This process is for really dirty watercraft that need some love. If your jet ski is not really that dirty then you can skip the simple green and just use car soap and water. If you just have one spot then can use a few simple green sprays onto a rag and just wipe it off. I like simple green because it’s strong but not too strong. Plus it’s safe for the environment which is important for watercraft since they’re in the water. One tool I do recommend is a scrub brush. 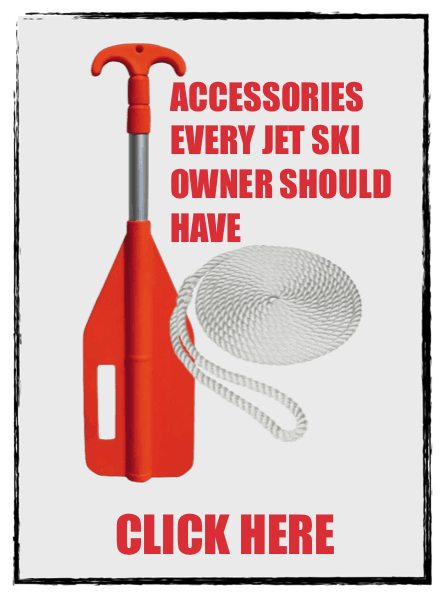 Having one of these long handle scrub brushes is a great tool to have in cleaning a jet ski. Just like the white rags, you’ll need a bunch of Microfiber Rags too. There’s nothing really groundbreaking here. Just some simple elbow grease and simple green. Using a scrub brush helps make your life easier. Rinse the seat and spray simple green on it. Using a scrub brush clean the seat. Rinse the cleaner off. It’s really that easy. To really clean the seats just use a magic eraser and simple green with water to really bring seats back. Works great on white seats! But Steven! The black spots are not coming off!!! Yea, they’re not coming off. Many people think its mold and some of it is, but the rest is freckles. Just like how skin can freckle in the sun so can vinyl. You can buy some vinyl cleaner that is made to attack mildew on seats. If you have a newer watercraft (under 2 years old) and the seat is turning a color like pink then you might have an issue with the seat and should let your local dealer know about it to see if maybe its warranty? Don’t expect anything free, but it’s worth a shot. When we get new guys in I tell them this “the watercraft only gets clean when you dry it off”. You would think that all the clean with soaps and degreaser was what was getting the craft clean and you would be correct, but the real cleaning comes from when you’re drying it off. Avoid using compressed air to dry the machine. You’re just moving dirty water around. You need to wipe it down with microfiber rags to actually get it really clean. They make fancy shammies that can absorb a lot of water in them, but I consider them a waste of money. You can’t beat the good old white rags we use to clean the watercraft and to also dry them. You take one white rag and go through and wipe the craft down. This first rag will get super wet so make sure to ring it out after it gets too full. Also in this first round, you’ll want to get the water out of the footwells. Just cup the rag in your hand and push the water out the back. Once you can’t push anymore try absorbing it up in the rag. I know it seems tedious but when you’re in the zone this is the quickest way, just get a rhythm. No need to get out a vacuum or some pump, you’re just wasting time, just get in there and push the water out and ringed it out with the rag. Once you have gotten the water out of the footwells and gone through the whole ski with that rag you’ll need to get rag #2. Just grab another rag and go back again over everything and get what little water is left. This rag will also need to be ringed out at least once. We’re not done just yet. Get a clean Microfiber rag and wipe dry the mirrors and any shiny pieces like chrome. Spot check the craft to make sure you got all the water off the jet ski. It needs to be dry. After the jet ski is all dry I like to use some spray wax to help protect it and give it a perfect shine. When doing spray wax make sure you’re somewhere it’s cool and not in direct sunlight. I use two types of cleaners, the Sea-Doo Spray Wax and SC1. The Seadoo stuff cleans and polishes and just works great. 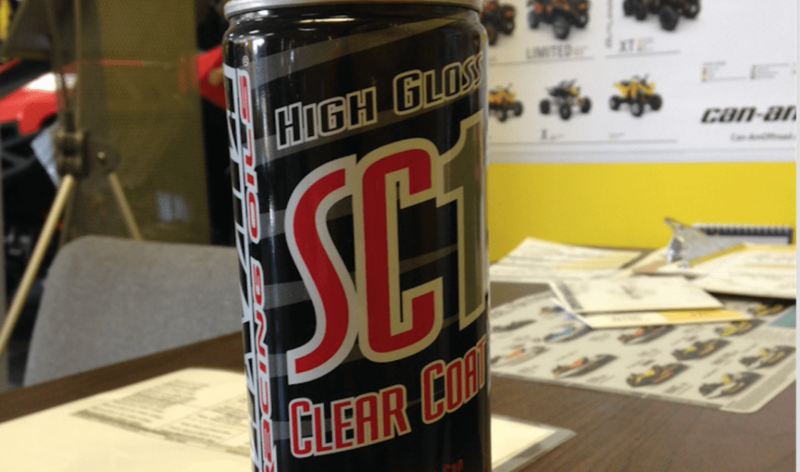 SC1 will make everything shiny and gives the best protection. 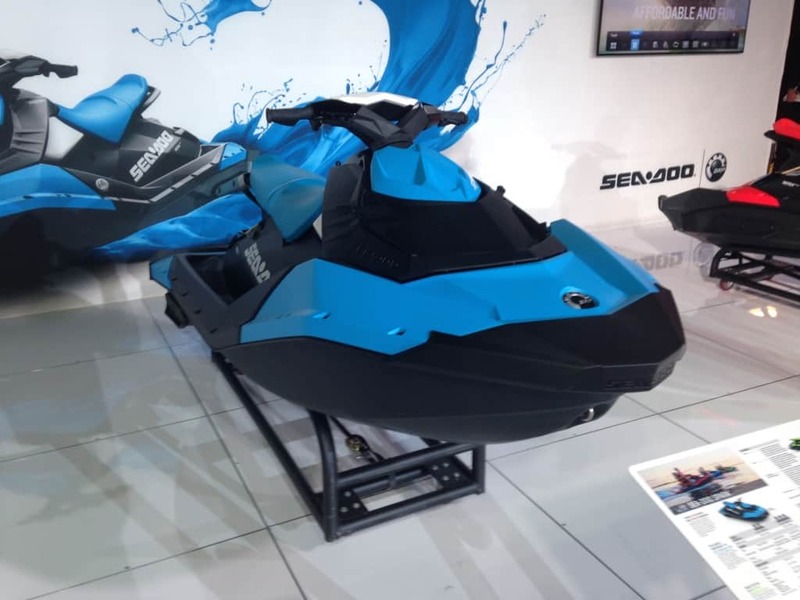 I will use both sometimes like the SC1 is perfect to make black plastics look good, but the Seadoo spray wax is my default. The Seadoo stuff doesn’t make the plastics look shiny but makes everything else look great! I can’t find where besides a Seadoo dealer that sells the Seadoo Spray Wax, but Maxima SC1 Silicone Spray works really well. You sometimes I feel I’m doing this wrong and many “pros” might not agree with me but… I like to take my Seadoo Spray Wax and just coat the whole thing down. Make sure you’re in a well-ventilated room if you do this. Then I go and I take what I call a “dirty rag” which is just any microfiber rag I have and just start cleaning. It’s important that you got all the water off as the water to avoid water spots. When I have gone through the whole jet ski with my dirty rag and clean up all the spray wax I then get what I call a “clean rag” out. A clean rag is my most perfectly clean microfiber rag, it usually a new one. This is my finishing rag. I go through the whole craft with this rag to wipe off the spray wax. ” Wax on – Wax off “. I usually start where the rider is and the mirrors and gauges. Then do the whole craft, I like to start where the person riding as this is where the most focus of the jet ski will be. It’s hard to believe I just wrote an almost 2000 word post on how to clean a jet ski. It’s hard to believe that I try to do this with every watercraft that leaves my hands. Over the years I have found ways to better understand what a machine will need and not need. 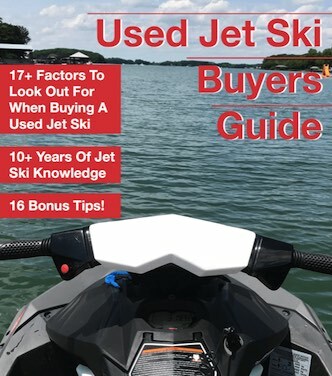 I hope you guys find this info helpful and I hope cleaning your jet ski will be a little easier now that you know some of my tricks. This is how I clean my Seadoo Watercraft and it still looks good today as when I bought it (besides some dings). Simple green will only stain bare aluminum. I’ve used it on Seadoo Engines without any issues. In the post, I’m more worried about getting simple green on an aluminum trailer as the stains will show up on that. Make sure to dilute the simple green and don’t let it sit for too long. Do I need to put on an anti corrosive spray? Only if you ride in salt water. Just spray everything that looks electrical with anti-corrosion spray (they make marine versions that you can get at WestMarine or online). I just bought a new gtx 300 limited. Putting it in the water for the season on this Friday. It’s salt water. Should I put some wax on it and anti corrosion spray on the engine before it even goes in the water for the first time? It will stay on a floating dock for the whole summer so I’m thinking I should give it a good layer of protection before hand. What is your thought? Thanks and I love your articles. Super helpful. Honestly, I wouldn’t on these new ones unless you’re doing winter storage. They already come from the factory with anti-corrosion on them and have many other anti-corrosion measures in place that it would be overkill. The best thing you can do is wipe the seats dry and then place the cover on it when you’re not riding it. Just make sure to use spray wax or keep them covered more often so they don’t fade as quickly. Surprisingly the black Sea-Doo are not the biggest issue, it was the red ones that faded the quickest and showed dirt the most.